On My Grabillas page you can login to your account with social networks. Sometime people do not want to do so, because they are worried about privacy of their screenshots. They do not want to inform social networks about what they capture, or they do not want to make their screenshots public. We want to clarify our accounts and social networks usage. And we do not even ask for these permissions on Facebook! We collect user’s emails to identify his|her identity and keep his|her captures history consistent. The same is applied to Google+ and other networks. 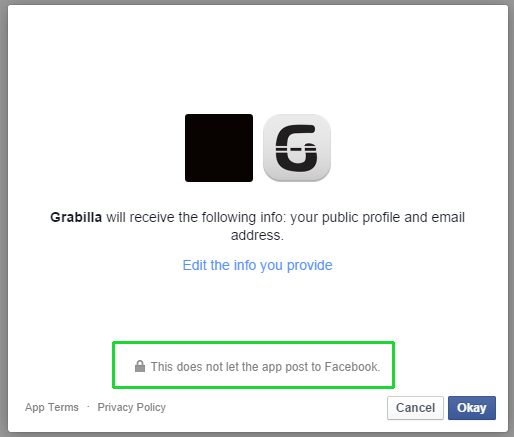 You can try to login with any network and check for permissions that Grabilla required. We are taking user’s privacy very seriously, and never share anything without user’s consent. Actually we just can’t do this. We do not show username or social account of owner on screenshot page. Only you, Grabilla user, can share your screenshots. We use very long page name, so it’s virtually impossible to guess. Remember: if you press Like button, +1 button, tweet about your screenshot or share it in some other way anywhere, your screenshot is no longer secure. If you want to have an account on Grabilla to keep your screenshots history – use account where you do not have friends or followers, like Yahoo! If you want to be absolutely sure that no one can access your screenshot (except someone who you trust) you can protect your screenshot with password. To read more about password protection follow this link.